I was going through this article in which there is a mention of India or 'Bharat' not being called as a country until in the Third century BC Ashoka used 'Jambudvipa' for 16 mahajanpadas which could be consolidated to realize the northern part of India. Is this correct, or I am missing something? The article is wrong saying the terms were coined during Ashoka era. It existed in both Hinduism and Buddhism which predate Ashoka by lakhs of years. Both of these terms occur in almost all the puranas. Jambu dvipa is an island which is mentioned in many puranas which means island containing Jambu fruits. It is one of the seven islands. Other being Plaksadvipa, Salmalidvipa, Kusadvipa, Krouncadvipa, Sakadvipa, and Pushkaradvipa. Bhāratavarṣa is a very old term than many avatars of Vishnu including Rama and Krishna. India is named Bhāratavarṣa due to emperor Bharata who is son of Ṛṣabhadeva in an answer which explains how the etymology of the word is derived and how it is coined. Nobody coined those two terms. Both are scriptural terms. They are found at many places in various Puranas. 141-159. Thus I have described to you the nature of Prakriti. So in this Punyabhumi Bharata Varsa, to worship the Devi is by all means desirable. In days past by, the King Suratha worshipped the Mula Prakriti Durga, the Destructrix of all evil. Then again Sri Rama Chandra worshipped Her when he wanted to kill Ravana. Since then Her worship is extant in the three worlds. He who gives his whole property to a Brahmin, gets in the end four times that ; there is no doubt in this. He who gives Jambu Dvipa to an ascetic Brahmana, gets undoubtedly in the end one hundred times the fruit. If you give away Jambu Dvipa, the whole earth ; if you travel all the Tirthas, if you perform all sorts of asceticisms, if you give shelter to all, if you make gifts of all sorts, know that you will have to come again to be reborn in this earth ; but if you become a devotee of Mula Prakriti, then be sure that you won't have to come here and be reborn. So, those two terms existed in the scriptures much before Ashoka's era. 0 Child! Now hear about the seven Dvîpas and the seven Oceans :-- The first is the Jambu Dvîpa; the second is Plaksa, the third is S'almalî; the fourth is the Kus'a Dvîpa; the fifth is Krauncha; the sixth is the S'aka Dvîpa; and the seventh is the Puskara Dvîpa. The second Dvîpa Plaksa is twice the first Jambu Dvîpa and so on; each succeeding Dvîpa is twice as large as its previous one. [Lord Vishnu said] O Gange! You will also have to take incarnation in Bhârata as a river, purifying all the worlds, to destroy the sins of the inhabitants of Bhârata. Bhagiratha will take you there after much entreating and worshipping you; and you will be famous by the name Bhagirathî, the most sanctifying river in the world. There, the Ocean born of my parts, and the King S'ântanu also born of my parts will be your husbands. O Bharatî! Let you go also and incarnate in part in Bhârata under the curse of Gangâ. So, here the country Bharata Varsha is being referred to. The existence of Ashoka is doubtful in itself, considering that there is no documents (pre 19th century) or stone engravings (except a minor one in Karnataka, was it fabricated ?? ), that acknowledge him anywhere. Coming to the question about Bharata, it is older than the king's name - a combination of BHAva, RAga, TAala - the three aspects of cosmic dance. Bhārat comes from the Bhārata dynasty founded by Emporer Bhārata, son of Dushyanta and Shakuntala. The story of how he came to be called Bhārata (the cherished) is in Adi Parva & the play Abhijñāna Shākuntala. It originally referred to only a northern portion of India. 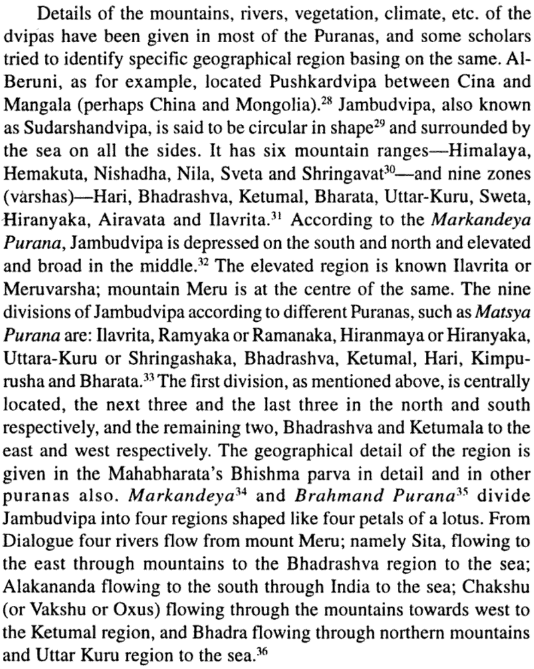 In Puranic cosmography, Jambu-dvīpa is the center of the world around which lay seven concentric island continents (sapta-dvipa vasumati) separated by seven concentric oceans. According to the Bhagavata Puranam, The name Bharata in Bharata Varsha is attributed to the great Saint King Bharata, also called Jada Bharata. Before renouncing the kingdom and becoming an ascetic he was a great monarch ruling all of Jambu Dwipa. Sri Sukha himself says this to Parikshit. Not the answer you're looking for? Browse other questions tagged history kali-yuga india geography .